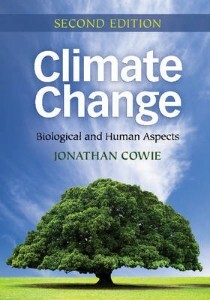 Whilst terrestrial climate change may not seem of direct significance to astrobiology, this comprehensive tome, now in its second edition, serves the perfect introduction to topics like solar energy budget, atmospheric composition and the resultant global climate that are all key factors on the habitability of any planet. Chapter 1 offers a entry-level primer on the basics of terrestrial planetary climates, covering topics including the energy balance of absorbed solar radiation, reflected sunlight and re-radiated thermal energy; the effect of greenhouse gases in the atmosphere and the relative contributions of different molecules, the carbon cycle and the major sources and sinks; and planetary periodicities such as the Milankovitch cycles driven by variations in the axial tilt, orbital eccentricity and precession of the equinoxes. Chapter 2 explains the indicators and proxies that can be used to infer temperature in the past, such as the ratio of oxygen-18 to oxygen-16 ratios, and so track Earth’s climatic conditions back through deep time. Also of particular interest to astrobiologists will be Chapters 3 and 4 which provide a clearly-written overview of past climate change on Earth (as inferred using the aforementioned proxies and indicators) from the prebiotic world around 4 Gya, through the great oxidation, evolution of vascular plants and through to the most recent ice ages and the current interglacial period. Chapters 5 and 6 deal with the predicted effects of the surging atmospheric carbon dioxide levels today, in terms of likely temperature increases, sea level rise, ocean acidification, the response of ecological systems, extreme weather events like droughts or hurricanes, and shifts of oceanic and atmospheric circulation. Whilst these specifics are perhaps less directly relevant to astrobiology and exoplanetary habitability, they make for fascinating, if not somewhat alarming, reading nonetheless. The last few chapters cover the human impact of climate change, such as disease and food security, and the international policies intended to curb further carbon emissions. The book is well supported by clear figures and diagrams throughout. All-in-all, Climate Change, is a thoroughly-researched, comprehensive guide to this interdisciplinary science, encompassing everything from planetary to political processes, and is recommended for anyone wanting to learn more on this important topic.